The Songbird, Ms. Regine Velasquez may be holding a lot of excellent titles in the field of music, movies and television, but if you talk to her at length, you would know in your heart that it is being Mommy to three-year-old Nate that gives her life the utmost inspiration. It is along this line that PLDT HOME’s Mother’s Day Campaign finds a most opportune time to give tribute not only to the artistry of Ms. Regine Velasquez but also to the real values in life she holds dear. For the voice that never fails to bring us back HOME belongs to a devoted and loving mother to her only son Nate. 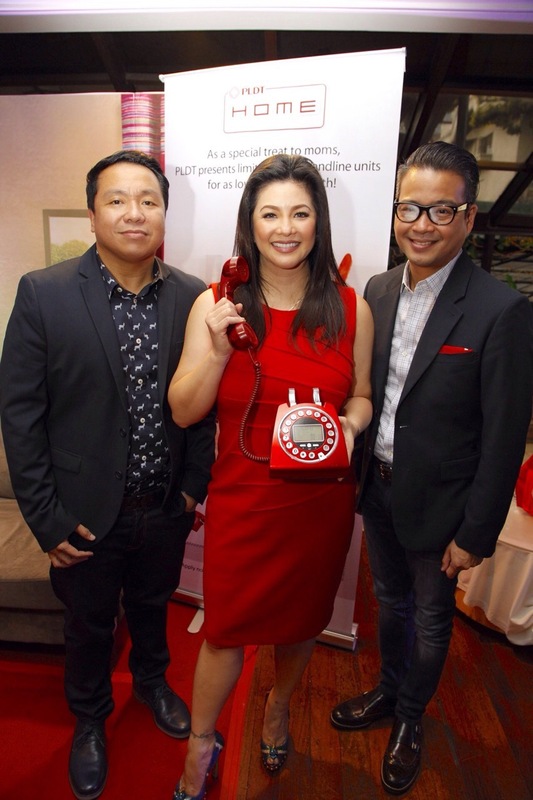 The Mothers’ Day campaign introduces the new landline Telsets featuring the Regine Series paired with PLDT’s best calling rates ever. Subscribers with landline get a wonderful treat with the following offers: Add as low as P75/month to get new telsets with features depending on the unit like Caller ID or Answering Machine; Add just P75/month for FREE NDD Calls (PLDT to PLDT Nationwide) + P10 per call to SMART/Talk N’ Text; and Add only P50/month to enjoy Free 15 minute calls per month to US, Canada, China, HongKong, Singapore, Guam and Hawaii, with lowest IDD rate of P2/succeeding minute. Regine is happy with her connection with the PLDT HOME team. “They have been very supportive of everything I do. They allow me stay connected to my own home and for a working mother like me, you know that keeping in close contact with our family is everything. Especially that I have a growing little boy who never fails to surprise me with his discoveries every single day,” she enthused. “When I became pregnant, my sisters and my friends told me my life was going to be different. I realized I had no idea what they were talking about. Not until I had Nate,” she said with a satisfied smile on her face. “Everything about my life changed completely. I have a totally different perspective now, a different outlook in life,” she declares with contagious enthusiasm. Mrs. Ogie Alcasid considers every single day blessed. Her marriage was immediately gifted by this bundle of joy she and her husband christened Nathaniel James. “He will turn four in November. How time flies! So far, so good. We are very, very happy with how things are with Nate. A lot of people tell us how behaved and good a kid Nate is. Hindi siya yung katuladng ibang bata na sobrang malikot kahit nasa labas. He behaves well. He is not a spoiled brat because we are very conscious of that, being an only son so far. He listens to us when we caution him. He remembers what we teach him. We couldn’t be prouder,” she shares. Regine confesses that she didn’t think at first that it was in her to be the one to give Nate some spanking. “But I did it. I think I have spanked him three times already for throwing away things, like my Ipad. We have learned a lot from our Pastor in church how to discipline a child. From ages 0-12, our Pastor told us that we can instill discipline in them and break their developing pride by spanking. Past that age, it will be very hard already. If you spank them when they are older, you won’t be breaking their pride anymore, but their spirit,” Regine said. “I think our parenting style is working because Nate is a well-behaved boy and is truly a joy to be with even when we travel long distance,” she added. When asked what she considers the highlights of being a mother so far are, Regine was quick to say, “Everyday is a highlight!” And we believe her. For this particular interview (done behind the scenes of her pictorial for PLDT HOME’s Mother’s Day campaign), Reginesaid Nate was with his Yaya nearby waiting for her to finish. “He is very patient because we explain to him that we need to work. Sometimes we think our children don’t understand this kind of things. But in my experience, I know that children are smart and they have the capability to understand and comprehend, more than what we want to give them credit for. It shouldn’t stop us adults, from involving them,” she said. The doting mother says they are training him to speak in fluent Tagalog right now saying that Nate is learning English easily from school and the television shows that he watches everyday. Unlike most Filipino parents who give more weight on teaching their children to speak in English, the Alcasids differ in perspective. “Mas weird kasi kung hirap siya sa Tagalog bilang nandito naman tayo sa Pilipinas,” Regine said with so much logic. “The beauty of this stage in my son’s life is that he really converses with us now. Before kasi, nagsasalita siya perowala pang sense. Now, it’s so nice to talk to him. Nagkukwentona, nakakatuwa! Regine is very grateful for the kind of workload that she is allowed to have at this point in her life. “I had a major shift in my priorities and I am so thankful that the people I work for understand this. I still get to work to help my husband but the load is just perfect for me to still be very much present in my son’s life. I am truly blessed,” she says. So what is her dream for her Nate? Regine answers from the heart. “I have none. I feel that it is his job to dream for himself, whatever and whoever he wants to be. I feel that I have to allow him the same liberty that my parents gave me when I was growing up. Binigyan ako ng kalayaan ng mga magulangko na mangarap, kaya ako nandito ngayon. Yun din ang gusto kong ibigay kay Nate,” she said. Regine believes that the role of the parent is to make sure that their children grow up instilled with discipline and values. “We are here to provide support and the necessary ammunition for them to work on and realize their dreams someday. If anything, I just want my Nate to grow up to be a follower of Jesus Christ. When he fears God, I know that his future is set,” the example of a mother who knows best, ends.